If you want to walk off some of the extra pounds from your Thanksgiving feast, join us on Friday, November 24th for a local history tour. We’ll visit institutions we’re thankful for, like the Queens Botanical Gardens, and talk about some neighborhood additions that are still in progress, like the Kissena Corridor Park Mediation Garden and the Kissena Way addition to the Brooklyn / Queens Greenway. Come out with us to enjoy some fresh air, light walking, local history, and dreams for the future. 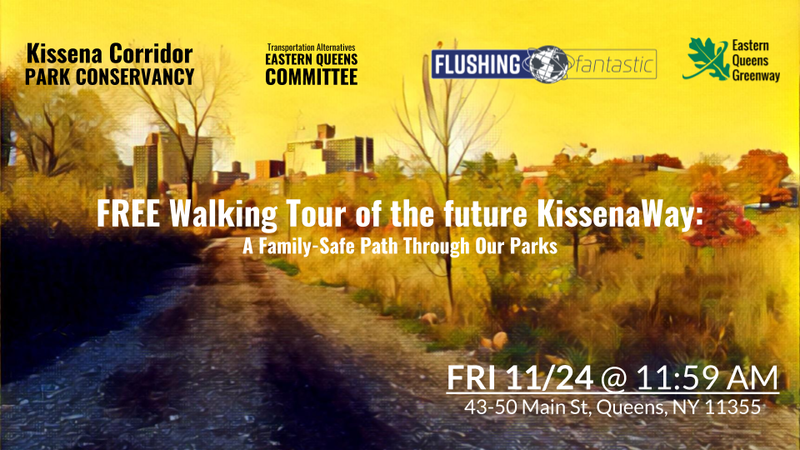 What: A family friendly walking tour along the paths of the future Kissena Way trail (approximately 3 miles roundtrip). Who: This event is open to everyone, free of change, no RSVP necessary. The event is organized by the Eastern Queens Greenway, Kissena Corridor Park Conservancy, Transportation Alternatives Eastern Queens Committee, and Flushing Fantastic. Why: It’s important to take a break and come together as a community, to learn about what we have to be thankful for and work together to keep improving our neighborhood. After party lunch: After the walk some of us plan to have lunch at Dumpling Galaxy. If you would like to join us, please bring cash for dumplings. We may post updates here and on Facebook. We look forward to seeing you on the walk.